Once you've mastered the art of how to fish effectively down through a salmon pool it is very important that you master the art of effectively playing a salmon too. There's a few important factors to keep in mind once the excitement of the initial contact is under control and you're ready to play your fish. Normally the initial take from a salmon will come 'out of the blue' to catch you off guard so early composure is very important. Reacting to a salmon take too early accounts for thousands of lost opportunities each year on the salmon rivers of Scotland so it is important that you wait until you start to think you've almost given the salmon too long before you clamp the reel face to set the hook and only after you've briefly felt the salmon's weight should you ever lift the rod. Now that the hook has been set effectively your rod tip must remain high throughout the fight. This high rod position assures steady pressure on the salmon with the added cushioning effect should the salmon bolt suddenly. This high rod position also keeps your fly line away from any subsurface obstacles which could snag your fly line so never let the rod tip drop when you're playing a salmon. If your salmon takes off downstream at any point in the fight it is important that you follow it to regain a 'side on' fight position if at all possible. 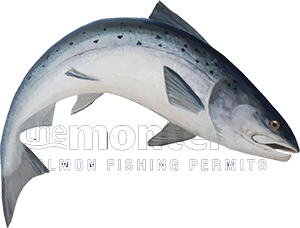 If you try to play a salmon that is way below you then you'll be playing the weight of the river too and all the hook hold pressure will also be directed out of the fish's mouth instead of into it which can often result in the loss of the salmon. When playing your fish take your time and just release your fly reel when the salmon starts to pull away and draw line back onto the reel when the fish eases off its pressure and eventually this will tire the fish out. While you are playing your salmon always be scanning for a suitable slow, deep area of the pool to land the fish in. Never try to play a fish in fast or shallow water as both will give you very little control of the salmon in the latter stages of the fight when full control is important for effective landing.